Disclosure: I received one or more products in this post in exchange of an honest review. All opinions are my own. This post contains affiliate links. I come from a decently large family. Most holidays we get together to celebrate with a large meal. On the best times, someone is manning the grill outside! Oh how I love me some BBQ! I am from Kansas, ya know! My love of BBQ lead me to working with Zaycon Fresh. They have great varieties of meat and most recently I've fallen in love with their pork ribs. My new love of Zaycon Fresh's ribs lead me to this creation. It is really easy and I recommend it to everyone I know! Heck, I'll recommend it to you and chances that I've never met you face to face are big! 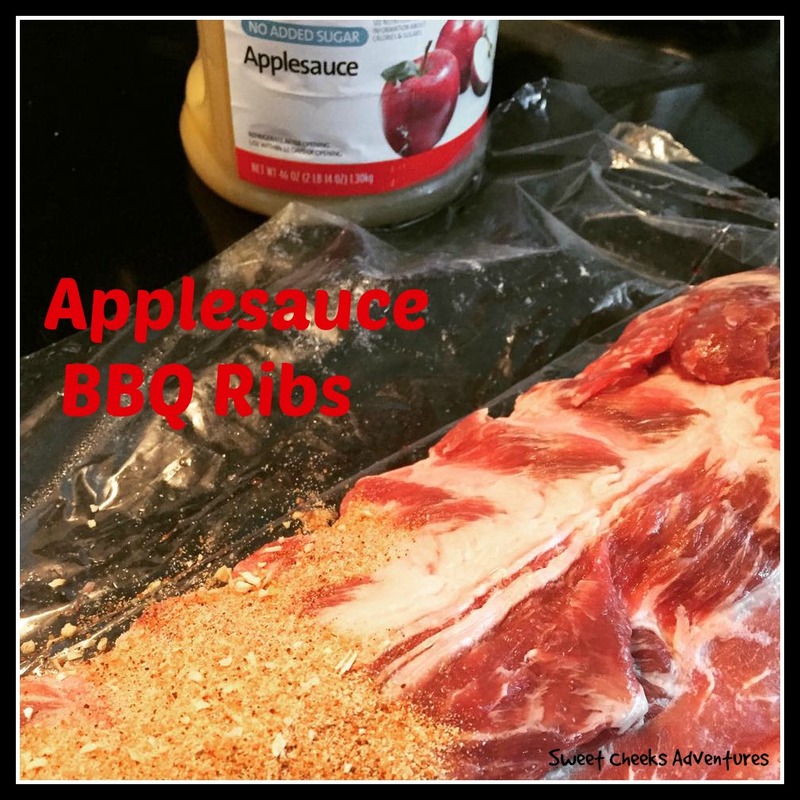 Like I said, Applesauce BBQ ribs are super easy and SUPER delicious! It's a matter of making the rub, breaking out the crock pot and waiting. The waiting is the hardest part. Oh the AGONY!! Throw all of these seasonings into a bowl and mix together. Equal parts of each, except the Chili Powder unless you'd like to burn your face off. Lay out your rack of ribs (you'll find the delicious Zaycon Fresh Pork Ribs above) and rub your mixture into the meat. So delicious! I like to massage it in a little bit to make sure the flavor will be absorbed while cooking. Once you've rubbed your ribs to your liking, I chopped my rack into quarters so it would fit in my crock pot. I find it does not effect the end result in any way to do this. 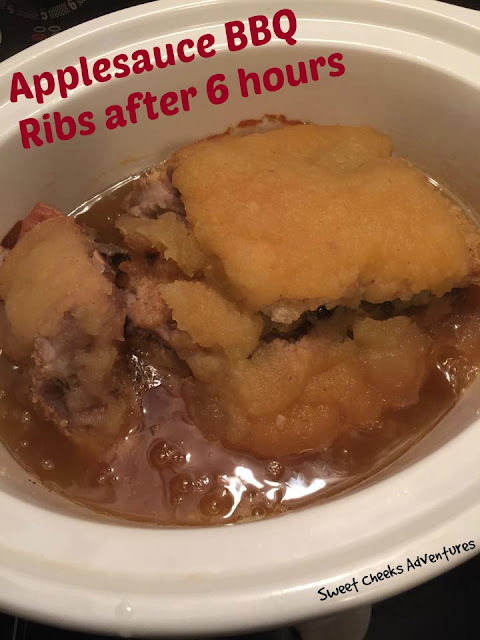 Stack your ribs in the slow cooker, but before going to the next level, spread applesauce over the top. You don't need to have a ton of applely-goo on top, but be sure to cover it. Resume your stacking of the ribs until the slow cooker is full or you run out of ribs. I have done this with regular applesauce and cinnamon applesauce. Either is a nice treat! Leave your slow cooker to do all of the work at this point. Cook on high for about 6 hours. The applesauce and ribs will come together in marriage. The best marriage, I tell you! After the longest 6 hours of your life, you'll find something like this. Whew! Grab those babies out of that slow cooker and either slap them on the grill or in a oven approved dish. 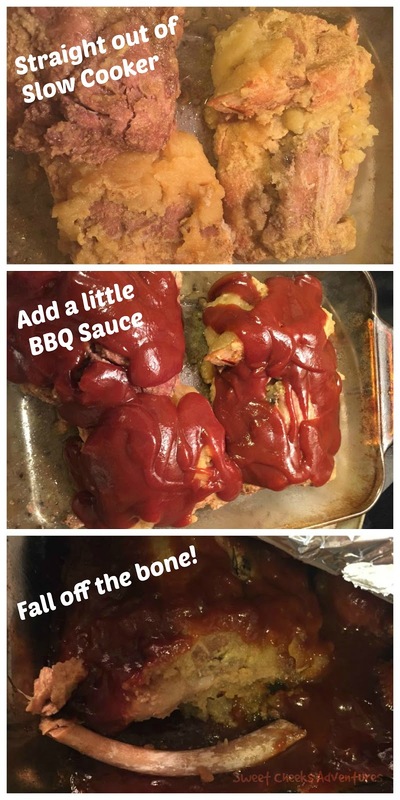 Cover with BBQ sauce and pull off when you think necessary. If you're putting them in the oven, I went another 30 minutes to let the BBQ sauce really sink in! I have made this recipe 4 times now and it just gets better and better every time! The meat falls off the bone and the ribs are full of flavor! Perfect for a BBQ meal for a holiday, a Sunday Family meal, or simply because you want bbq ribs! Whatever the occasion, check out Zaycon Fresh because oh my Goodness, their ribs are top notch! Zaycon Fresh has so many more options than Ribs. They have CHICKEN, SAUSAGE, BEEF, STEAKS and many many more options! Connect with them on social media and order your next lot of meat. You won't be disappointed. Denver Broncos are going to the Super Bowl!!! This would be good to serve at my party.